Always a Chomping Ground favourite, Ombra comes into its own in the summer, thanks to it's nifty little sun-deck outside. From lunchtime to early evening it soaks up the sun and there's a handful of tables and chairs outside to sit and enjoy a Negroni and a plate of Venetian food. It's even by the canal like Venice, too. We recommend one of the sharing platters - the mix Italian is meaty and tasty while the fish mix is complimented by a range of seafood textures and flavours - or one of the salads, the burrata and rocket is always a winner, or the fennel and blood orange one kicks a nice fruity and peppery punch. If you're lucky, the chef Andrea and co might even be frying up some fresh fish on the grill outside, too. Open every day except Mondays. The sister site to Lardo (just down the road), Coppa opened up for the first time last year in the rooftops above London Fields. It felt a little like finding a speakeasy at first, ducking down passages by the railway arches and climb to the top of the building, but there wasn't really a better hang-out in the area once that ol' sun was shining. We love the Italian-inspired little huts and tables - also dressed in kitsch plastic lemon bunting - and once we nab a deck-chair, we aren't moving any time fast. Good thing the menu is perfect for a long day of boozy grazing - pick away at their charcuterie plate, perhaps some salami or lardo followed by some cool and creamy mozzerella. The rotisserie offers a super-tasty free range roast chicken, and if you're lucky, you might just be in for a spiral of grilled spicy 'n' juicy 'Nduja sausage too. Wash it all down with a granita - bitter lemon is delish - an Aperol spritz or one of the guest beers on draft. Only open Thurs-Sun and bank holidays. Over in Hackney Wick, CRATE Brewery has become a firm favourite for a summer-time hangout, thanks to it's expansive outdoor area, it's great craft beers and pizzas and just the whole general Wick vibe. 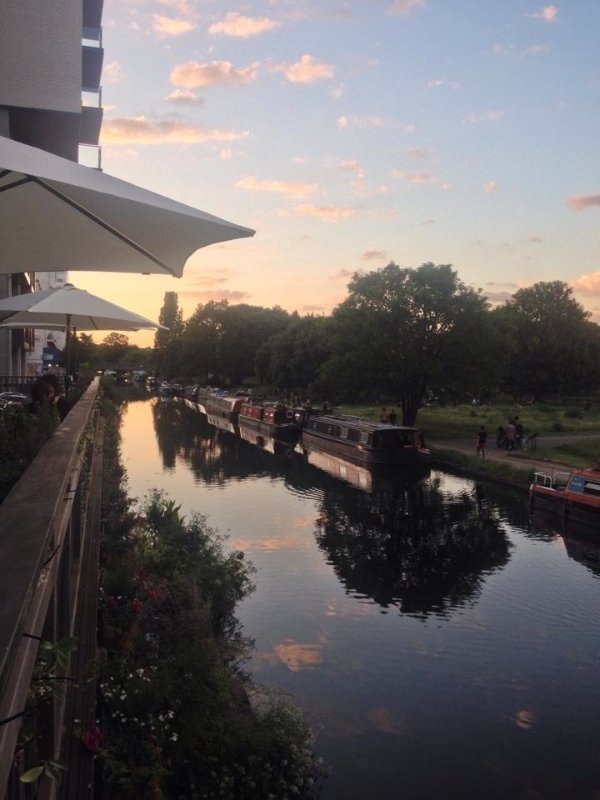 It's another slice of canal-side living where you can pull up a perch and dream that you're somewhere slightly further afield than E9. But in all honesty, why would you want to be anywhere else when the food's this good? The stone-baked pizzas have made a name for themselves as the best around, with inspired toppings to enjoy like courgette, Feta, red onion and gremolata; Laksa chicken or middle-Eastern lamb, spinach and pine nuts. It obviously gets busiest on weekends and even more so now as they've just launched their Street Food Sundays food market, with extra portions of tasty thanks to The Rib Man and PopDogs. Open daily, with the kitchen open midday to 10pm. Another E8 rooftop favourite, Dalston Roof Park, now hosts an excellent cafe/restaurant called Merci Marie. Climb up the few floors of stairs and not only are you rewarded with a open-air, birds-eye view of D-town, but also one of the area's self-professed "best kept secrets", too. Whoops, sorry to blab, guys. It's mainly a breakfast, brunch and lunch kind of joint, but is also open on Wednesdays and Fridays for a dinner service too. Wednesdays are "all around the table" from 6-10pm where the gang experiment with new flavours, perhaps a salt cod gzoya and truffle oil or smoked duck breast with fresh figs. Fridays are a pre-booking affair, with a set-menu of three courses for just £23, which might include dishes like fish terrine, citrus salsa and caperberries or a pan-fried mackerel fillet and nicoise salad. Bonus - it's BYOB on Fridays, perfect to toast that impending sunset. OK, it's a little hidden away, but how much better does a meal taste when you've had to work for it? You'll be thanking yourself when you sit down with a glass of white wine on their sun terrace, watching the joggers run along the canal and the house-boats floating gently beside it. Yep, all this and you're only a short walk from the urban bustle of Bethnal Green. Ink is Lithuanian chef Martin Meid's baby and it offers a really creative and playful menu of ingredients and flavours. His reliance on the herbs and edible flowers grown just outside in his little garden are perfect for mid-summer, when you might tuck into scallops with burnt onion and peach puree, topped with little pretty colourful additions from the greenage area outside. Mains include a perfectly-cooked portion of salt cod with three tomato textures and dessert makes summer berries the star of the show with some homemade ice-cream, perfect to round off a sun-drenched meal outside.